Two fifth grade teachers explain how the driving question and the need to know list are a naturally fit for their PBL pilot program. Students presenting ideas to City Council on how to make our city more fun. 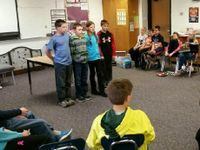 Editor's note: Matt Weyers and co-author Jen Dole, teachers at Byron Middle School in Byron, Minnesota, present the ninth installment in a year-long series documenting their experience of launching a PBL pilot program. Formative assessment is a crucial element of project-based learning and the education profession as a whole. Understanding how to swiftly and adeptly modify the scope of your lesson based on the needs of your students will play an enormous role in their learning. 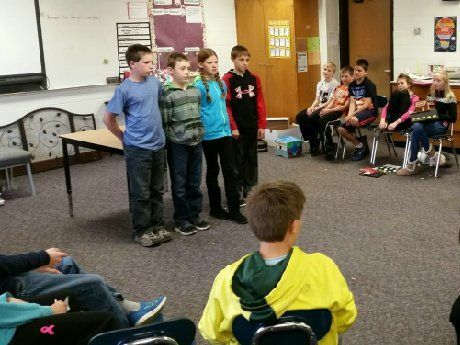 When we embarked this year on our journey of PBL, we found that there were several formative assessment strategies unique to PBL. In this post, we'd like to focus on two strategies that we found most helpful. 1. How Did Today's Lesson Tie Into the Driving Question? What is a driving question? A driving question is the roadmap to an entire project. An enticingly-written driving question will hook students into learning the exact content that we know needs to be covered according to our teaching standards. For example, here's the driving question we are currently using, developed with a "tubric" (a downloadable tool that helps you create specific and actionable driving questions): "How can we create a piece of art to be displayed in the Rochester (Minnesota) Skyway that represents basic human rights?" This question allows us to instantly tie the lesson to our language arts and social studies curriculum. Using the driving question as a formative assessment is a relatively simple process. At the end of every lesson, ask the students, "How did our lesson today relate to the driving question?" If they are able to successfully respond and elaborate, you will know that you have tied the lesson sufficiently to the project and that you have a better feel for future instructional needs. What is a need to know list? 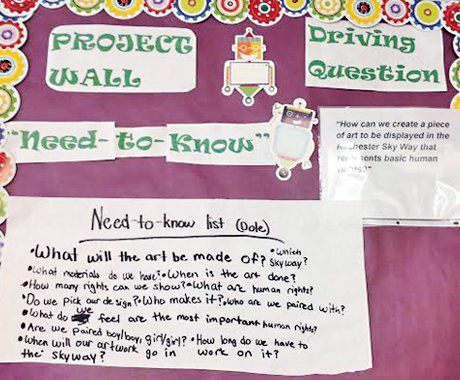 A need to know list is an essential element of PBL. 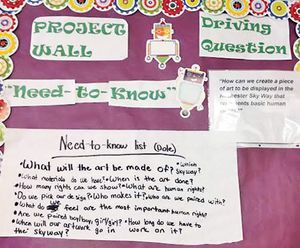 When starting a project that is organized around a driving question, it is helpful to have students generate a list of what they feel they need to know in order to successfully and completely answer that question. Once generated, this list serves as the perfect formative assessment tool by becoming a living document in which, by class vote, teachers can add or remove items from the list as they are answered. The true beauty of need to know lists is that, with a well-written driving question, students will naturally respond that they need to know the content knowledge outlined by the teaching standards the project is intended to cover. Picture of our current, "What "art" our rights?" project wall. At the end of each class period, ask students if they feel there are any items that can be crossed off the need to know list because they have been sufficiently discussed and answered in class. To gauge understanding, ask students to do a "thumb check" -- pointing a thumb upward if they feel they have sufficient understanding of the item from the need to know list, and pointing a thumb downward if they do not. If even one student gives a thumbs down, the item should stay on the list so that you can revisit it later as a class. This helps provide teachers with informal data on student understanding of the topic. Do you have any favorite methods of formative assessment? If so, we would love to hear them!